Since 1966, Landrum Spring has been a leading suspension specialist in the racing industry. Pit Stop USA is The Online Motorsports Superstore! We feature Landrum 10" x 2-1/2" I.D. Coil-Over Springs at low everyday prices. Pit Stop USA is The Online Motorsports Superstore! We feature Landrum 12" x 2-1/2" I.D. Coil-Over Springs at low everyday prices. Pit Stop USA is The Online Motorsports Superstore! We feature Landrum 12" x 5.5" O.D. Conventional Front Gold Coil Springs at low everyday prices. Pit Stop USA is The Online Motorsports Superstore! We feature Landrum 14" x 2-1/2" I.D. 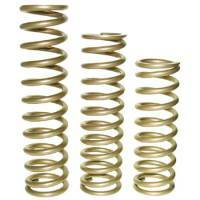 Coil-Over Springs at low everyday prices. Pit Stop USA is The Online Motorsports Superstore! We feature Landrum 4" x 2-1/2" I.D. Coil-Over Springs at low everyday prices. Pit Stop USA is The Online Motorsports Superstore! We feature Landrum 8" x 2-1/2" I.D. Coil-Over Springs at low everyday prices. Pit Stop USA is The Online Motorsports Superstore! We feature Landrum 9.5" x 5.0" O.D. Conventional Front Gold Coil Springs at low everyday prices. Pit Stop USA is The Online Motorsports Superstore! We feature Landrum 9.5" x 5.5" O.D. Conventional Front Gold Coil Springs at low everyday prices. Landrum 10" Gold Coil-Over Spring - 2.5" I.D. - 200 lb. Landrum 10" Gold Coil-Over Spring - 2.5" I.D. - 225 lb. Landrum 10" Gold Coil-Over Spring - 2.5" I.D. - 250 lb. Landrum 10" Gold Coil-Over Spring - 2.5" I.D. - 300 lb. Landrum 10" Gold Coil-Over Spring - 2.5" I.D. - 325 lb. Landrum 10" Gold Coil-Over Spring - 2.5" I.D. - 350 lb. Landrum 10" Gold Coil-Over Spring - 2.5" I.D. - 375 lb. Landrum 10" Gold Coil-Over Spring - 2.5" I.D. - 400 lb. Landrum 10" Gold Coil-Over Spring - 2.5" I.D. - 450 lb. Landrum 10" Gold Coil-Over Spring - 2.5" I.D. - 475 lb. Landrum 10" Gold Coil-Over Spring - 2.5" I.D. - 500 lb. Landrum 10" Gold Coil-Over Spring - 2.5" I.D. - 550 lb. Landrum 10" Gold Coil-Over Spring - 2.5" I.D. - 600 lb. Landrum 10" Gold Coil-Over Spring - 2.5" I.D. - 650 lb. Landrum 10.5" Gold Coil Rear Spring - 5" O.D. - 125 lb. Landrum 10.5" Gold Coil Rear Spring - 5" O.D. - 150 lb. Landrum 10.5" Gold Coil Rear Spring - 5" O.D. - 175 lb. Landrum 10.5" Gold Coil Rear Spring - 5" O.D. - 200 lb. Landrum 10.5" Gold Coil Rear Spring - 5" O.D. - 225 lb. Landrum 10.5" Gold Coil Rear Spring - 5" O.D. - 250 lb. Landrum 10.5" Gold Coil Rear Spring - 5" O.D. - 275 lb. Landrum 10.5" Gold Coil Rear Spring - 5" O.D. - 300 lb. Landrum 12" Gold Coil Front Spring - 5.5" O.D. - 1000 lb. Landrum 12" Gold Coil Front Spring - 5.5" O.D. - 1100 lb. Landrum 12" Gold Coil Front Spring - 5.5" O.D. - 1200 lb. Pit Stop USA is The Online Motorsports Superstore! We feature Landrum Leaf Springs and Landrum Leaf Spring Accessories for circle track racing. Racers who utilize the Leaf Spring Suspension & who compete weekly on the Top Racing Circuits Nationwide need Quality, Consistent, Durable Suspension Components. They demand the best... Why are Landrum Leaf Springs #1 is the Industry? Just ask the Winners... Landrum Leaf Springs feature extra heavy duty clench system prevents inconsistent side bite. Landrum leaf springs contain not only Chrome Vanadium, Landrum also has the correct mixture of Carbon, Manganese, Silicon, Nickel, Molydenum and Tungsten. This not only insures consistent and proper spring rate, but also the longest life! Landrum Leafs have a Teflon Insert to prevent inner leaf friction. Landrum Performance Springs feature diamond trimmed leaves, this is proven to maintain a more consistent spring rate than tapered end leaves. Landrum Springs feature the closest arch tolerance in the racing industry. Landrum racing leaf springs have more arch selections to and more rates to choose from than any other brand. Landrum Performance Springs are the leader in leaf spring quality and craftsmanship and is the most recommended brand in racing by chassis builders, warehouses, and professional racers. Landrum Spring Service was recently purchased by Mid-West Spring and Stamping a long time manufacturer of high performance springs. Landrum Spring, the leading suspension specialist in the racing industry, has been in business since 1966. Landrum is recognized as the industry leader in suspension components for the racing and high performance markets. We feature Landrum Chrysler Mono-Leaf Springs, Landrum Chrysler Multi-Leaf Springs, Landrum Chevy Multi-Leaf Springs, Landrum Chevy Mono-Leaf Springs, Landrum Pinto Leaf Springs, Landrum Aluminum Adjustable Lowering Blocks, Landrum Leaf Spring Sliders and Landrum Lowering Blocks at low everyday prices!